Chickpeas. They really are wonderful little things. We never really appreciated them until we went vegan. Now we use them to make falafel burgers, curries, goodness bowls…and we even use the juices from the tin to make vegan meringues! 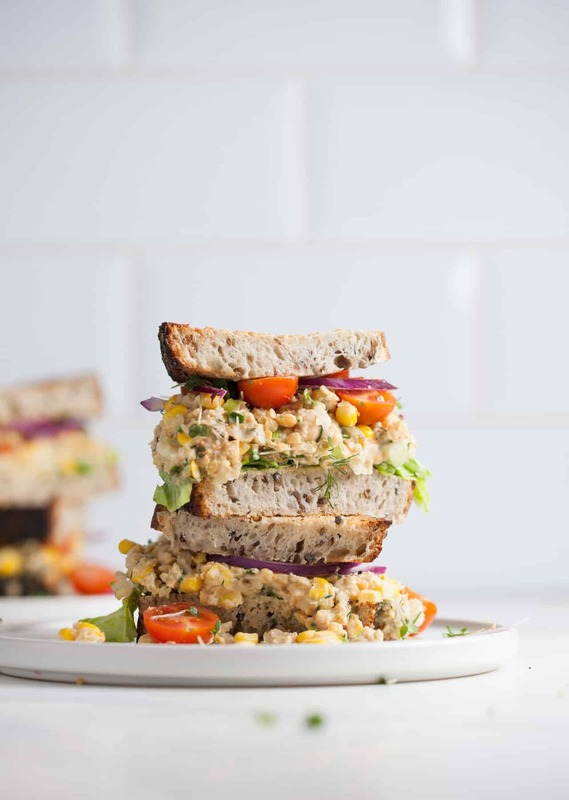 Next up in our chickpea adventure is this epic chickpea ‘tuna’ sandwich. 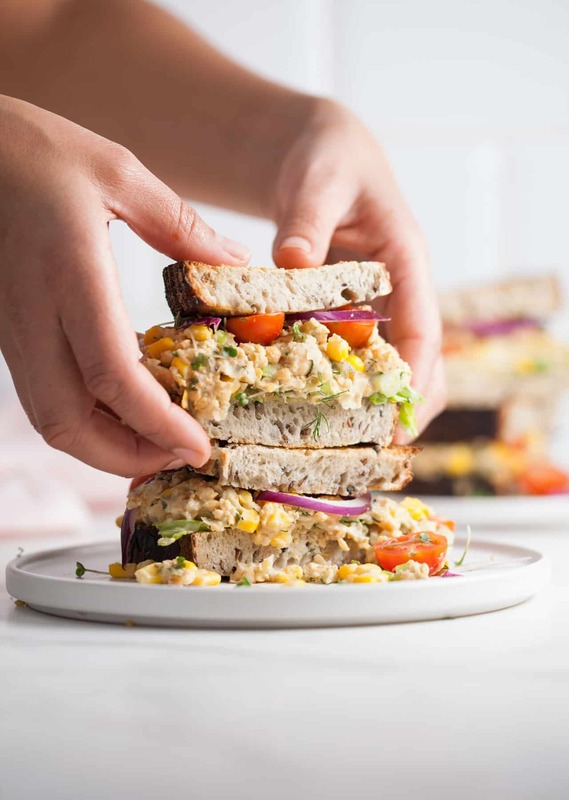 This sandwich really does remind us of eating tuna. The texture is strangely familiar, while the capers deliver that salty flavour of the sea. Oh, and it’s embarrassingly easy. This will take you no more than 15 minutes to prepare. Not bad, right? And don’t forget, if you love this, then you’ll totally love our debut 5-ingredient cookbook So Vegan in 5, which is available to buy right now. Drain and rinse the chickpeas, transfer them to a mixing bowl and mash them with a fork until mostly broken down. 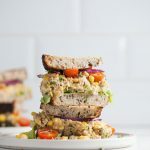 Thinly slice the spring onion and dill, and add both to the mixing bowl along with the sweetcorn, capers, caper juice, vegan mayo, lemon juice, mustard and pinches of salt and pepper. Stir until fully combined. 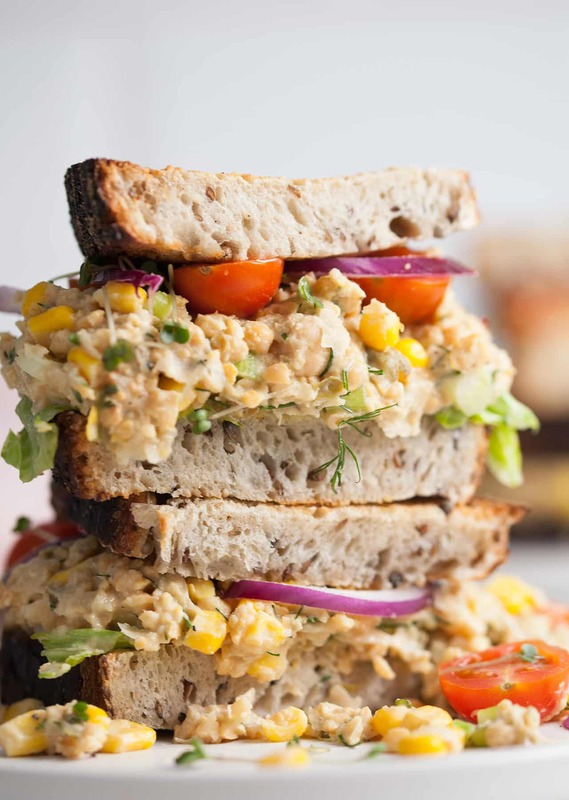 Toast the slices of sourdough bread until golden brown and spread one side of each with dairy-free spread. Roughly chop the lettuce, cut the cherry tomatoes in half and thinly slice the red onion. 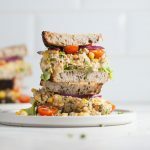 To build the sandwiches, add the lettuce on top of two slices of toast, followed by the chickpea ‘tuna’ mixture, a few slices of tomatoes, red onion and finally a small handful of cress. Finish with the second slice of bread and use a sharp bread knife to slice the sandwich in half to serve. Enjoy! This looks delicious! I love the fresh dill! Thanks for sharing.